The federal government is initiating a conversation with business, industry, academia, Indigenous Peoples, and different levels of government, to help develop a truly “Made in Western Canada” growth strategy. This strategy not only reflects the unique regional advantages of each province, but also helps to stimulate economic growth. This is an opportunity for the creative industries in the province to have a voice at the federal level by providing input on the creative economy, its value and importance, and how the federal government can leverage the talent and resources in this province to diversify and grow the economy in western Canada. Creative Saskatchewan has encouraged us to distribute this information. Your input will help shape the Western Canada Growth Strategy, a roadmap to build an innovative and inclusive Western Canada — one that stimulates the economy, strengthens the middle class and increases job opportunities for all Canadians, including Indigenous Peoples, women, youth, and new immigrants. Online discussion forum — Share your thoughts on five key discussion questions. Group discussion — Organize your own group discussion by checking out this toolkit for tips on how to plan a session, shape your conversation, and report back. Email — Send an email to wd.engages-mobilisation.deo@canada.ca with your ideas or suggestions. Letter — Send a letter to Western Economic Diversification Canada before November 9, 2018. If First Nations, Métis and Inuit organizations require additional information, please email wd.engages-mobilisation.deo@canada.ca and officials from Western Canada Economic Diversification Canada will follow-up with you directly. The engagement period will close on November 16, 2018. 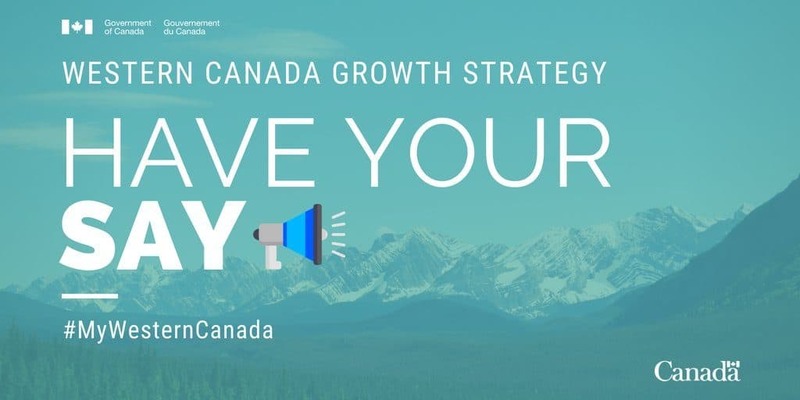 Follow #MyWesternCanada and @WD_Canada on Twitter or visit the Western Canada Growth Strategy website for updates.